This recipe is ridiculously tasty given the humble simplicity of its ingredients. It’s also pretty simple to prepare, although I will concede that the making of the potato parcels is, briefly, a little fiddly. Seasoned potato straws with a little onion stuffed into pockets of chicken skin which, after 40 minutes in the oven, turn into the most luscious, decadent side dish or snack you could wish for. The skin shrinks around the potatoes, both basting them and becoming crispy in the process. And since the more I blab on here, the longer you have to wait before trying these, so let’s get started. Quantities are guesstimate only, because everything depends on how much of the ingredients you have. One reasonably-sized potato will make about three finished parcels. Given the choice, I would recommend the skin from chicken thighs, which are a reasonable size and simple, rectangular shape. I’ve also tried this with the skin from chicken drumsticks – they were fine, and the natural cone shape meant only two sticks were needed for each one, but they were rather fiddly. Use the cocktail sticks to pin the edges of the chicken skin together, leaving one side open to add the filling. Peel the potatoes and cut into matchsticks. Alternatively, use a mandolin. Try and avoid making them too long, as this just makes stuffing them into the chicken skin more of a challenge. Chop with a knife if they look to be too big. Chop the onion finely and add to the potato. The quantity is entirely up to you. If you’re an onion fan, you could add an amount equivalent to the weight of the potatoes. At the other end of the scale you could use a couple of spring onions or even just snip some chives in. I like to use 1 shallot per potato. Stuff the pockets of chicken skin with as much of the potato mixture as you can. Press the filling in firmly, to make a tight parcel. Pin the opening closed with another cocktail stick. Arrange the filled parcels on a baking sheet. Sprinkle with a little salt (optional). Bake for 40-45 minutes, until the potato is soft and the skin crisp and golden. Allow to cool for 5 minutes, then remove the cocktail sticks. Top Tip: roll the sticks ‘in situ’ as it were, to loosen, then slowly draw them out. If you pull on them straight away, they might tear open the parcels, if the skin has roasted itself onto the stick. The parcels will hold together on their own, with the sticks removed, once cooked. Serve as a side dish or snack, with sauce to dip them into, if liked. Now, I’ve tried making this recipe according to my own personal rule, of abiding by the text as written, at least for the first time, and I have to be honest, it didn’t sit too well with my 21st century palate. It starts off interestingly enough, with the pumpkin flesh and the herbs, then suddenly we’re getting sugar, eggs, apples, currants and so on until it becomes a real jumble to the point where it is unclear whether it is supposed to be a sweet or savoury item. I decided to cherry-pick the ingredients that appealed to me and make a version that, if not completely authentic, is certainly less erratic than the above recipe, and so I went with the savoury half of the instructions only. The main problem with pumpkin, as I see it, is the lack of flavour, which can be improved somewhat by getting rid of as much excess moisture as possible. However, enclosing it in a pie prevents evaporation, to a certain extent, so partially cooking the pumpkin beforehand would help avoid sogginess as well as boosting the flavours. I opted for a dough crust, as opposed to pastry, as it can be a lot more forgiving with moist fillings than pastry. In addition, I made a lattice lid, which curls itself snugly around the filling, almost self-sealing during the cooking, thanks to the rise afforded by the yeast. Despite being enriched with milk, eggs and butter, the dough is wonderfully light and savoury and complements the filling very well. Put the flour, yeast and salt into a bowl. Cut the butter into 1cm dice and melt in 100ml of milk. Add the remaining milk to cool the mixture down to blood temperature, then beat in the 2 eggs. Pour the liquids into the flour and mix for 10 minutes with a dough hook on the slowest speed. Mix on fast for 2 minutes, then cover with plastic and set aside to rise for 1 hour. Melt the butter in a pan and add the diced pumpkin. Cook gently over low heat until the cubes have softened and are half-cooked. Set aside to cool. When cool, add the herbs and spices and season to taste. Tip out the dough and deflate. Divide the dough into 2 equal pieces. Set one aside. Grease a 24cm spring-form tin. Roll out the other piece of dough to a thickness of 5-10mm. Line the tin with the dough, allowing the excess to hang down over the rim. Add the cooled filling to the tin and spread evenly. Roll the second piece of dough to a similar thickness, and cut into 1cm strips. I find using a pizza wheel to be the most effective utensil for this, as it doesn’t drag the dough. Dampen the edges of the pie using a pastry brush dipped in water. Use the strips of dough to make a lattice top. I find it easiest to start from the middle of the pie and to work outwards. This page has step-by-step images of the technique. When the lattice is complete, dampen the edges again and cut a final extra-long strip of dough. Press this strip firmly around the edge of the pie, covering the ends of the lattice strips, then use a sharp knife to trim off the excess dough. Brush with beaten egg and set aside to rise while the oven heats up. Bake for 35-40 minutes, until the dough is cooked through and golden brown. Cool on a wire rack for 10 minutes before removing from the tin and serving. I’ve decided to go all autumnal this week with this comforting, root vegetable tart. It was inspired by a recipe from 1604 for parsnip pie. It can make the basis of a light lunch or be served as an accompaniment to a main meal. Its simple flavours are enriched by generous use of butter, with which both carrots and parsnips become glorious. And by generous, I mean about 50g, less than two ounces in old money, so hardly extravagent either budget or health-wise. And yes, I’ve hopped onto the current ‘spiral tart’ craze to provide the impressive appearance, but I would argue that it is only a development of the apple rose tart, so neeners! Like the apple rose tart, and unlike most of the current crop of spiral tarts, this tart also has a filling beneath the decorative vegetable ribbons – the remains of the vegetables carved up for the decoration are steamed and then mashed together with lashings of butter and pepper. They give the tart both substance and richness. The top two tiers are steamer pans, over a regular saucepan. You can cook all the side dishes for a Sunday lunch in this – potatoes in the bottom and up to four vegetables in the steamer baskets – at the same time, on one burner/ring on the stove, removing the baskets from the stack as the contents are done. I use mine daily. Other vegetables you might like to try with this recipe: beetroot, turnip, swede, butternut squash, courgette. Peel the carrots and parsnips, then cut into ribbons. I find a Y-shaped peeler is best for this. Cook the ribbons in a steamer basket over boiling water for 5 minutes. Set aside to cool. Chop the remains of the vegetables into cubes and steam over the boiling water until tender. The parsnips will probably require more cooking than the carrots, so have them in separate steamer baskets so you can remove them when done. Even though they will be mashed, you don’t want them mushy. Mash the cooked vegetables together. Don’t be too thorough with your mashing – it’s nice to be able to see flecks of both vegetables in the mix, and it gives a mottled, almost marbling effect. Add 30g of the butter, and salt and pepper to taste. Set aside to cool. When cold, spoon the mashed vegetables into the tart shell and smooth over. Arrange the ribbons of vegetables in alternating circles on top. You can begin in the middle or on the edges of the tart. Preheat the oven to 180°C, 160°C Fan. Melt the remaining butter and brush lightly over the top of the vegetable ribbons. Bake for 20 minutes, then cover lightly with a foil tent to prevent the vegetable ribbons from burning, and bake for a further 10 minutes. Cool in the tin for 10 mintes before removing and serving. Still on a French theme, but from a different source than the one I had planned. This is an adaptation, albeit very slight, of a recipe by Madeleine Kamman in her gastronomic memoir, When French Women Cook. Aside from the originality of the recipes, each has a wine recommendation – how fab is that? Wandering through the Fresh section of the supermarket, (the orange one, in case anyone’s curious) I was reminded of this recipe when I spotted some baby Brussels Sprouts – endearingly cute, grape-sized morsels. Now I know they’re not everyone’s favourite, but this recipe might turn even the most vehement opponent. You don’t have to use mini ones at all, of course – full-sized are fine – but the mini ones have a charm ( much needed in certain circles, when Brussel Sprouts are mentioned). You could also make this with broccoli instead of sprouts, but I’d urge you to try it as is, just once. I’ve made four, individually-sized tarts, but you can make a large one and bake for just 10 more minutes. They make for a lovely light lunch, but can also serve as a side dish. NB: Don’t eat these hot from the oven. The flavours are distinctive, but delicate. Allow the tart(s) to cool to just warm before serving. Put the flours and butter into the bowl of a food processor and blitz until the mixture resembles breadcrumbs. Tip the mixture onto a floured surface, knead smooth. Divide the pastry into 4 and roll out thinly (5mm). Grease and line four individual tart tins with the pastry. Alternatively, line one large (20-24cm) tart tin. Leave the excess pastry overhanging the edges of the tin(s), cover with cling film and chill in the fridge until required. Remove the outer leaves of the sprouts and trim the stalk. Bring a pan of water to the boil. Cook the sprouts and cauliflower for 4 minutes. Drain, retaining the cooking liquid. Melt 20g butter in the pan and add the drained vegetables, salt and pepper. Toss gently, cover and cook over medium heat for a further 5 minutes. Remove the lid and allow any liquid to evaporate. Remove the vegetables and set aside to cool. In the same pan, melt the rest of the butter. Add the flour and cook for 3 to 4 minutes. Gradually add 225ml of the vegetable cooking liquid and the milk. Whisk until smooth and thickened. Adjust seasoning and add a good grating of nutmeg. Remove the pastry-lined tin(s) from the fridge, trim the excess pastry and crimp the edges. Arrange the cauliflower and sprouts in the pastry cases and scatter over the ham. Pour over the white sauce and allow to settle into the gaps. Spread a thin layer of crème fraiche over the top of the tart(s). Bake for 30-40 minutes until the pastry is crisp. If the top seems to be browning too quickly, lightly cover with a sheet of baking parchment. Allow to cool until just warm before serving. Here’s a recipe that’s very close to my heart, and in essence it could hardly be simpler. Ful Medames – pronounced Fool Med-Ammas – is, on the one hand, cooked, dried broad beans, and at the same time, a meal of almost infinite variety. I became a fan of Ful when I was teaching in Kuwait and there was a Shwarma shop on the short walk between the school and my accommodation, so it was easy to call in and pick up the making of a meal if I was feeling lazy. The standard Chicken Meal was: a rotisserie chicken, a pot of creamy-smooth hummus – none of your lumpy ‘artisan’ hummus in the Middle East thankyousoverymuch – 6 flatbreads and a pot of Ful Medames. Although a warm chicken and hummus flatbread is divine, the pot of Ful was almost more enjoyable because of its simplicity – my desert comfort food, made all the more delicious I suspect because someone else had made it. Of course, it helps if you like fresh broad beans, aka fava beans, to begin with, but by the same token, their flavour is quite different when dried and subsequently reconstituted. In the UK you can get British dried fava beans, which are small, skinless and a pale creamy colour when dried, but my preference is for the large brown mature beans with their skins intact, both for the added texture and flavour. You can get fava beans, cooked, in tins, but I’ve never tried them myself. They might do if you just wanted a taster before soaking and cooking a whole batch of dried beans. Your call. At its simplest, you soak the beans and then simmer them until they are soft and mashable – and that’s it. That is a plain version of Ful Medames, but if you like broad beans, isn’t objectionable. I’ll be the first to admit it’s a pretty dull version too, because the beauty of Ful is how the basic batch of beans can be tweaked and varied by the addition of some very simple ingredients. One batch of dried beans makes enough for five meals for one. Ful Medames is regularly eaten for breakfast in many countries in the Middle East, but it is also ideal for a weekday lunch if you have the means to warm it through at work. So I thought I’d offer suggestions for five different versions, to switch up things for a week’s worth of lunches. For a further twist, each recipe gives quantities for a single serving, so don’t forget to scale it up if you’re planning on serving more than just yourself! Put the ban into a bowl and cover with water to a depth of 5cm above the level of the beans. Leave the beans to soak overnight. Next day, drain the beans and transfer to a large pan. Bring to a boil, cover with a lid, turn the heat down low and simmer until the beans are tender. This should take between 2 and 3 hours, although possibly longer depending on the age of the beans. Check for tenderness after 2 hours, and add a little more water if necessary. When the beans are tender, drain but retain the cooking liquid. Return the beans to the pan and mash whilst hot. I prefer to leave some larger pieces mixed in for texture. Gradually add some of the cooking liquid back into the mashed beans until the mixture resembles porridge. Personally, I like the mixture to be relatively thick and holding its shape on a spoon. If you prefer a more liquid version, add more of the cooking liquid. It is important to get it to the consistency you like before it cools, as it will set firmly when cold. Adding liquid to cold beans runs the risk of it being too sloppy once it’s warmed up again. This is the basic state you need to get your beans to, then you can pack the Ful into plastic boxes and pick one of the serving suggestions below. 500g of dried fava beans will make 5 x 250g portions of prepared Ful. I suspect that this is probably the Egyptian style of serving, having been brought to the Gulf countries by the many expatriate workers, but it is the version I was introduced to by the Shwarma Shop and is my favourite. Put the beans into a small pan over a low heat to warm. Put the garlic, lemon juice, oil and cumin into a mortar and pound into a paste. Add this mixture to the beans and stir to combined. Allow to simmer together for five minutes. Taste and add salt and pepper to season. 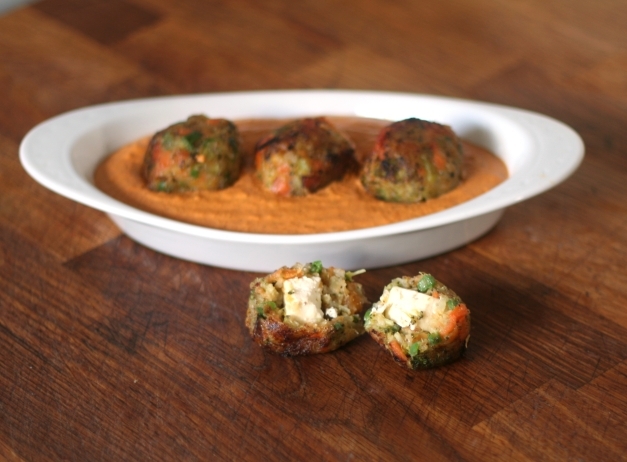 When you’re happy with the flavours, spoon into you serving dish and drizzle with a little more olive oil. Sprinkle over the parsley, onion and sumac and serve with warmed flatbreads. Put the beans into a small pan. Chop the tomatoes, garlic and shallot and add to the pan with the coriander. Simmer over a low heat for 10 minutes or so until the tomatoes have begun to break down and the onions softened. You don’t have to go to Egypt to enjoy Ful for breakfast, this mix of egg, salad and warm beans is deliciously comforting eaten outside on a cool spring or summer morning. Prepare the beans with the Kuwaiti seasonings. Dice the tomato and cucumber, slice the onion and toss the salad in the lemon juice. Season with salt and pepper. Spoon the beans into your serving fish and arrange the egg and salad on top. Sprinkle generously with black pepper and serve with warmed flatbreads. I do like contrasts in a dish and this version of Ful is a great example. The warm, earthy beans and fresh, cool, juicy tomato, the fiery chilli and chilled, creamy cheese, all set off by crisp, dry flatbreads. You can vary the strength of the chillies from mild de-seeded jalapenos, through fiery birds eyes to “Are ya CRAZY! ?” Scotch Bonnets and the like. Similarly with the cheese. Any mild, white cheese is delicious. Labneh (scroll down for the oh-so-simple recipe here) is traditional, but cream cheese, goats cheese and feta are all just as good. Pour the prepared beans into your serving dish. Spoon over your cheese and sprinkle over the chilli. Add the tomato and parsley. Drizzle with olive oil and sprinkle over the paprika and pepper. This is surprisingly substantial. It is a vegetarian version of a Lebanese dish of spiced ground beef served on a bed of hummus. The combination of the creaminess of the chilled hummus and the warm, spiced beans is fantastic. With flatbreads, it is definitely main meal size, unless you reduce the quantities by half. Spread the hummus onto your serving dish and mae a hole in the centre. Spoon the prepared beans into the middle of the dish and add the chickpeas and parsley garnish. Sprinkle with the spices and serve with warmed flatbreads. Look, I know it’s early, but I suddenly realised that if I don’t get started soon on Festive Food I’m going to run out of weeks. Also, people might want to plan ahead, practice, etc. etc. So I’m buttoning my lip on grumbling about it being too early for either the C-word or X-word and here we go! 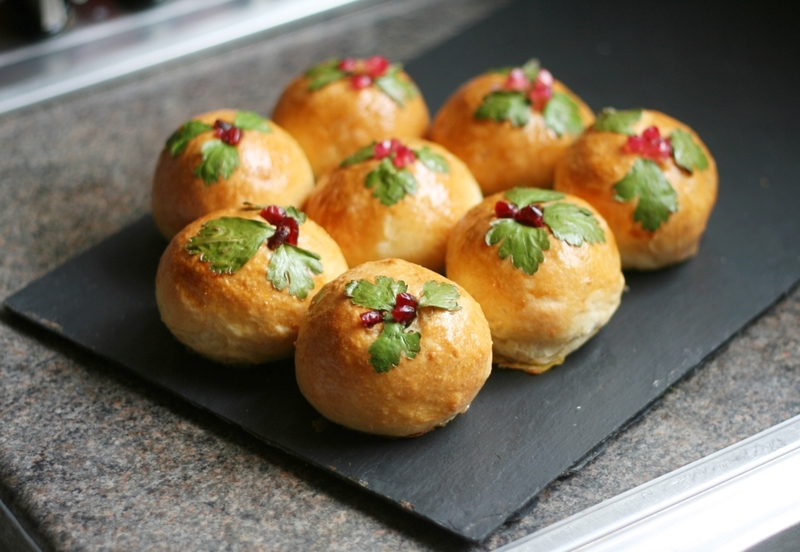 First out of the gate some cute little brioche rolls with festive holly decoration. The crust, if you can even call it that, stays wonderfully soft, and although enriched, they aren’t especially sweet, and so can be used for practically any meal of the day. These rolls are also a great way to get ahead with your Festive Food planning, as they can be baked and then frozen until required. A little extra care is required in the freezing, so that the decoration doesn’t get damaged, but nothing too precious. I have Festive Food ideas lined up for the next five weeks, but will also try and help with any food ’emergencies’ if I can – just leave a comment here on the blog. The extra eggs and butter in enriched dough mean it takes longer to rise that ordinary dough, so the easiest approach is to spread the making over two days. Mix the dough in the evening and set to rise overnight in the fridge, then shape and bake the rolls the following morning. Mix the salt, yeast and 500g of the flour. Mix the rest of the ingredients together and pour into the flour. Mix thoroughly to a smooth dough. Add the remaining flour until the dough is soft but knead-able. Knead for 10 minutes – I use a food mixer and dough hook. Set aside to rise for one hour. Gently knock back the dough to release the air and fold it in half twice (like a napkin). Put the dough in a greased bowl and cover with cling film. Set to rise overnight in the fridge. Next day, tip the dough onto the work surface and pat down gently. Cover with cling film and allow to rest for about 30 minutes. Divide the dough into whatever size rolls you require. I usually make 16 rolls from a batch this size. Shape the dough into balls and set onto a baking sheet lined with parchment paper. Cover lightly and set aside to rise until doubled in size. Prepare the parsley for decorating the buns. I find keeping three leaves attached as a sprig is much easier to handle. Whisk the egg for glaze with a little water. Brush the risen rolls GENTLY with the beaten egg wash.
Lay the flat-leaf parsley sprigs on the top to look like holly leaves, then brush over the leaves with the egg wash. This will help keep them stuck to the surface of the rolls and also protect their bright green colour from the heat of the oven. Bake for 15-20 minutes until puffed and golden. Remove from the oven and cover with a clean cloth. This keeps the steam in and thus the crust soft. Press dried cranberries into the tops of the buns to make little clusters of berries nestled between the holly leaves. NB DON’T do this if you’re going to freeze them, do it when thawed, warmed and just before serving. Arrange buns side-by-side in a zip-lock bag. Slide a baking sheet underneath the bag (so they lay flat in the freezer) and freeze. Once frozen, remove baking sheet and keep the buns somewhere where they won’t get bashed by anything – the parsley leaves will just crumble. To serve: lay on a baking sheet and cover with foil. Warm gently in the oven. Decorate with cranberries and serve.